I’ve also been distracted with launching the Internet Safety Podcast. It’s been a labor of love and quite a bit of fun so far. My co-host is Joe Brockbank, who was one of my classmates in the Computer Science Department at BYU in the late 1980’s. Why are we doing this? We want to help parents and families to understand how to maximize the amazing benefits of technology while minimizing the downsides. We believe the Internet and technology are here to stay. We also believe that parents must become educated. Pulling the plug at home isn’t going to cut it. Your kids are going to be exposed to a variety of technologies, and we have to be in a position as parents to help guide them and keep them safe. I know I’ve written about some interesting, educational, and just plain silly things over the past year, but this one is a bit more serious and important. I encourage you to go check it out. If you find it valuable, please let your friends and family members know. If you have questions you’d like us to address on the podcast, feel free to leave a message on the podcast, or email me directly. Last spring I joined Facebook. I was doing research on internet safety, and wanted to get a better look at some of the popular social networking phenomena. Facebook seemed like a tame place to take the social networking plunge. Keep in mind that I didn’t do anything there. I just showed up. No picture, no real information about me. Think grandpa with a press pass at a Hannah Montana concert. My college age kids (two daughters, one son) quickly became excited and added me as a friend. (Nice to know that $200/month in milk for the past 10 years actually meant something to them.) Apparently I was cool for being on Facebook. Sweet! I’ll take it wherever I can get it at this stage. I was added by a few other students that I knew. I invited nobody, and lurked occasionally. Still posted no picture. Don’t want to appear like I’m taking this too seriously. Just an adult passing by the sandbox. Moving along. Just an old guy. Nothing to see here. As you were, children. So I lurked… and surfed… like once or twice a month. I learned a few things on Facebook–like the unmarried daughter now had a boyfriend. Isn’t that something? I live 12 miles away, and am a professor on the very campus where this sweet daughter of mine attends college, and I learned about her new relationship on Facebook. Nice looking guy actually. Checked him out. Great set of pictures. Cool major. Saw who his friends were. Seems like a great guy. Met him in person a few weeks later. Yep, great guy. The following week I received an invitation from a business associate with whom I’ve done work in years past, and who is part of my professional network on LinkedIn. Nick, what are you, weird?! What are you doing on Facebook? Don’t you see my press pass? Hannah Montana for crying out loud! I accepted his invitation. Didn’t want to be rude. I surfed for information on a student. Checked out his friends. His dad is on Facebook. Picture and everything. Yeesh. Preferences? His dad’s favorite book? I asked this 22-year-old how he felt about his dad being on Facebook. “Cool!” Huh. I stare at my press pass, wondering if I’ve bypassed a coolness acceleration moment by remaining a non-committed Facebook lurker. 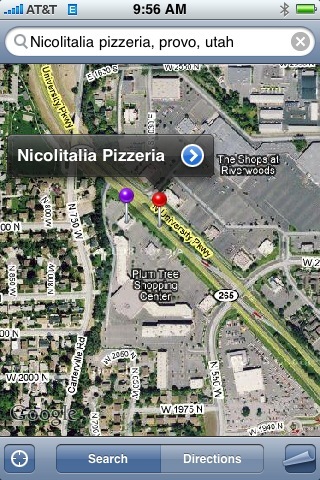 I mean, someone has to provide adult supervision here. I asked one of my daughters some time later why I never see her on MSN Messenger anymore. “Mostly I chat on Facebook now, Dad.” OK. Hmmm. I log back in. I’ve received an invitation request from… my wife?! What is THAT all about?! “The girls showed me how to get set up on Facebook and I decided to see what all the hoo-hah was about.” You go girl. I’ll stay here in the back, away from the Hannah Montana mosh pit of adolescent energy. Next week I check out my wife’s profile, which publicly declares that she is, in fact, married to me. She has posted a profile, and it includes a picture of… US. My cover is blown. My visage is now on Facebook. Oh dear. What to do? Her list of friends now includes a healthy chunk of our extended family, most of them college age, all of whom think my wife has scored some sort of pinnacle of coolness. They all start inviting me to be their friends as well. Riding my wife’s coolness coattails. Not the first time. I accept all incoming requests, as long as I know them. One week later, family pictures begin to show up in photo albums on my wife’s page, visible only to individuals whom she has personally accepted into her network of friends. (Whew! I taught her that one, after my Education Week classes on Internet Safety.) Great pictures. How come I’ve never seen these before? “They’ve been on my laptop, but I figured I’d share them with the entire extended family.” Pictures of our April trip to Hawaii. The extended family is going crazy. Comments on the pictures. I can’t resist. I add a few comments of my own. My wife likes them. She thinks I’m funny. 🙂 Always a positive score in the Knutson household when the mom thinks the dad is funny. More invitations, more pictures, the mom feels “Happy and Content,” according to her Facebook page. Yesterday her page announces that she “is looking forward to date night. It’s the best night of the week!” That’s date night with me, BTW. More upswing on the home front. On my page, Facebook implores me to “Update your status…” Like I want the world to know my status. I ponder the press pass. I break down. I post a picture of myself. Of course the mom is in the photo. Touche’. I accept eight more invitations from people I care about a great deal. This Fall at BYU I’ve returned to teaching CS 404 (Computers and Society) after a one year hiatus. One new twist I’ve implemented is to require all students in the class to create a public blog and post their work for the world to see. My motivation is for the students to discover that broader audiences exist for writing than TAs and professors. From what I’ve seen so far, this simple twist alone has induced a dramatically higher quality of writing in the students than I’ve seen in semesters past. So by way of introduction to my small but loyal readership, I hereby introduce you to a set of talented, up-and-coming writers and imminent Computer Science graduates, the Fall 2007 CS 404 students of Brigham Young University. You will find links to their 36 individual blogs in the blogroll in the right-hand column. Do you dare turn down this invitation?! 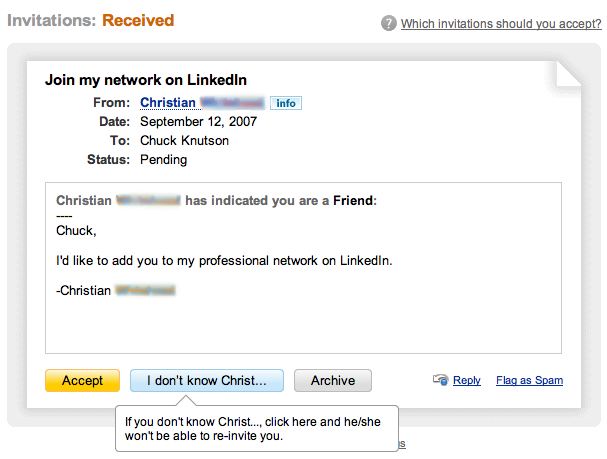 Yesterday I received an invitation for a LinkedIn connection from a friend and former student named Christian (last name obscured for his privacy). 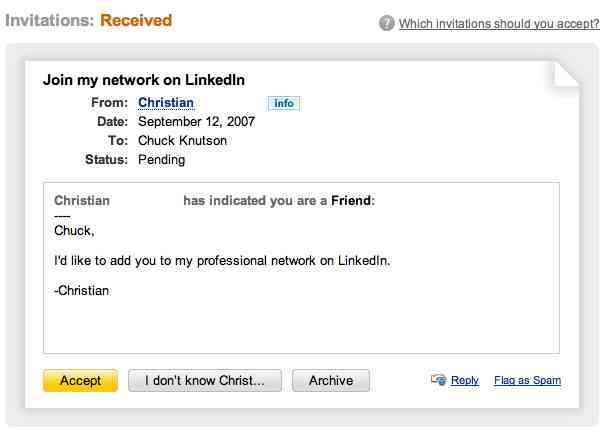 LinkedIn invitations allow the recipient to indicate whether the inviter is an actual acquaintance, helping to regulate unwanted advances of the type so prevalent on less professionally-oriented social networks.